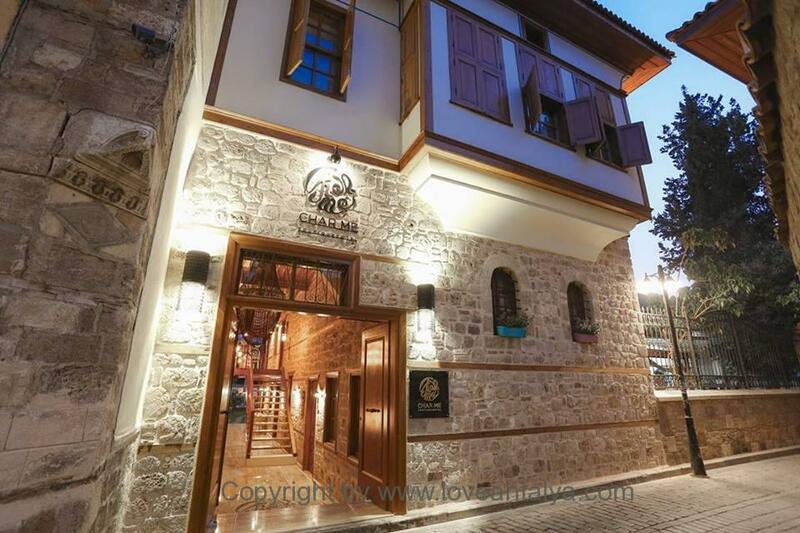 Sponsored Posts: When I was in Antalya this spring, I was lucky to encounter the beautiful CharMe Boutique Hotel inside the old town of Kaleici. An exceptionally nice little hotel with only a few rooms, the most beautiful surroundings and a phenomenally good service. Kaleici is in a rapid development and changes from time to time I’m there. There is always something new and exciting going on all over the place. And what a joy to see all this innovation, goodwill and so many interesting people, who think new thoughts, see Antalya and Kaleici in a different light and invest heavily in the district. 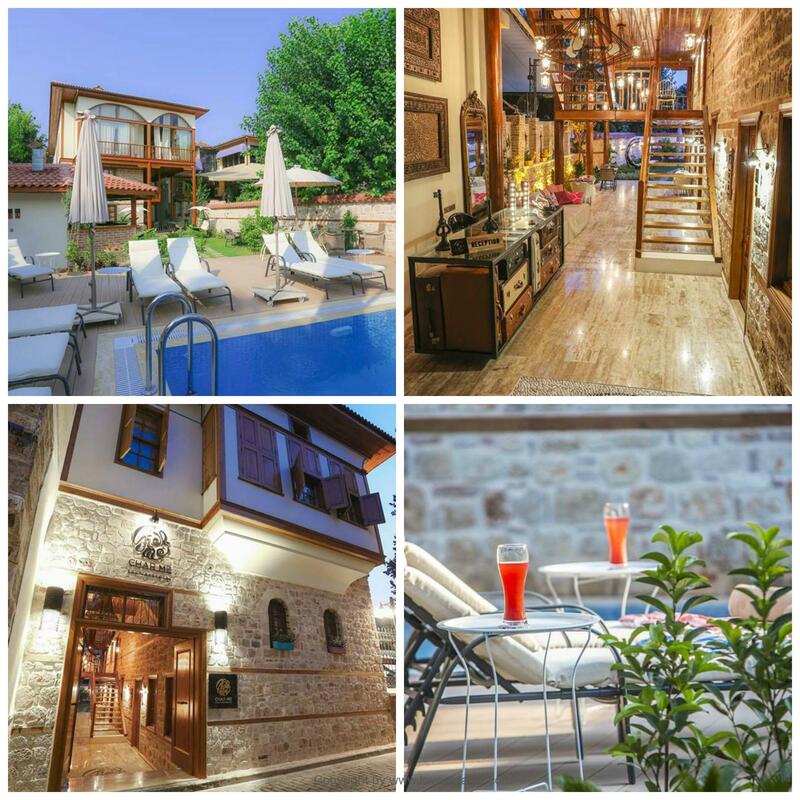 One of the people is Nurcan Sen. She and her husband have built the charming boutique hotel CharMe up from scratch. And it is an amazing job, they have done. It was a very nice hotel I visited, and it was obvious, that they had used a lot of effort and lifeblood in the restoration. 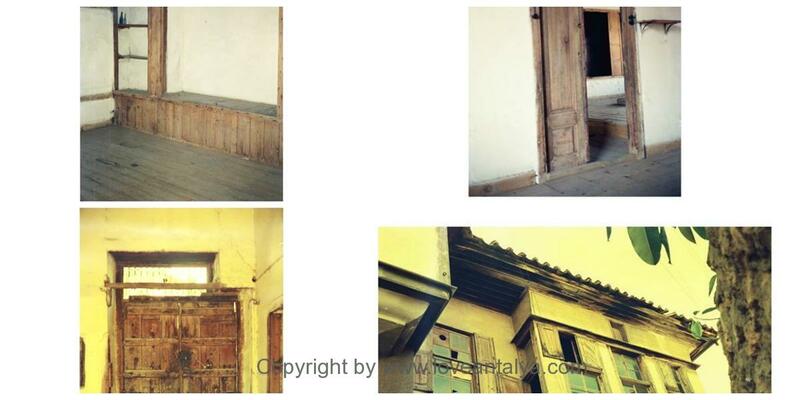 When they bought the ground, there was nothing but ruins on the spot – and the most beautiful massive wooden door. The door was something that Nurcan fell in love with and it is now restores after best practices. Like the rest of the hotel. Because everything is made and refurbished with top score. Nurcan was kind enough to show me around in the hotel. 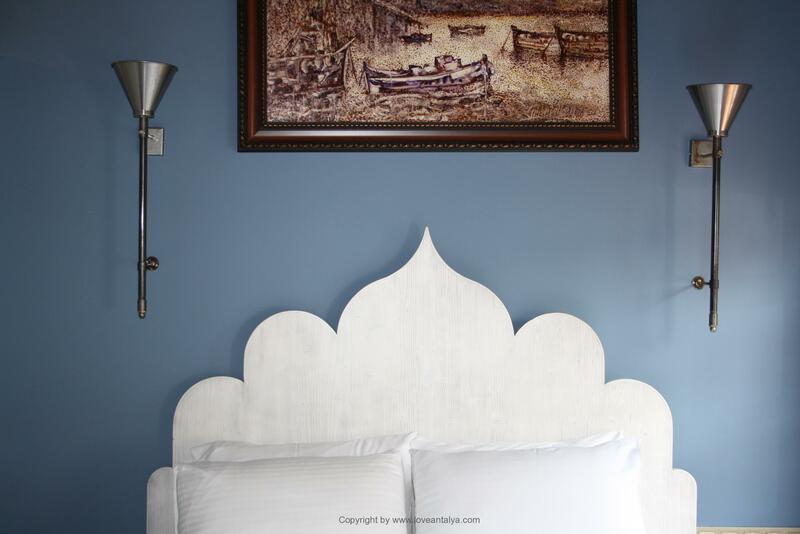 All the rooms were different but with the same recognizable thoroughness, care and style. 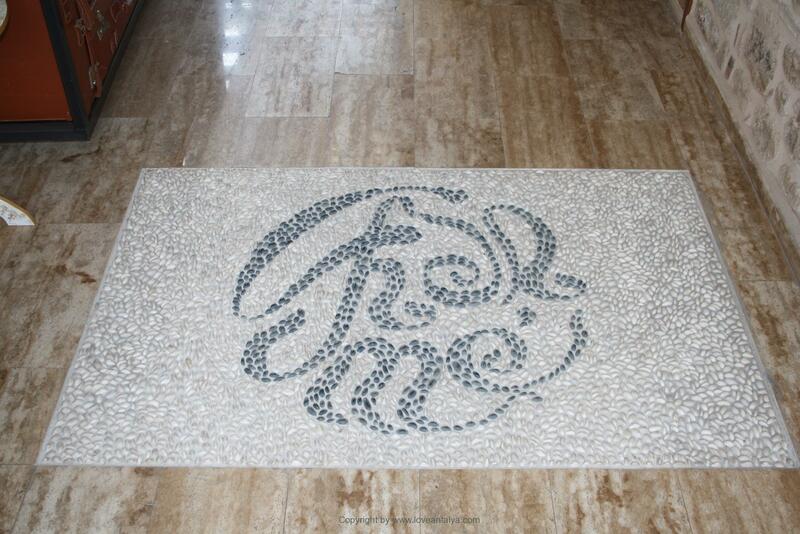 Most of the furnitures are custom designed for the location by Nurcan or the associated interior designer. In all the rooms there was a fairly clear modern Turkish style – some places almost oriental and above all very cozy with small lamps, gauzy curtains and cushions everywere. How fun with such different rooms and super exciting to discover for a design-nerd like me. 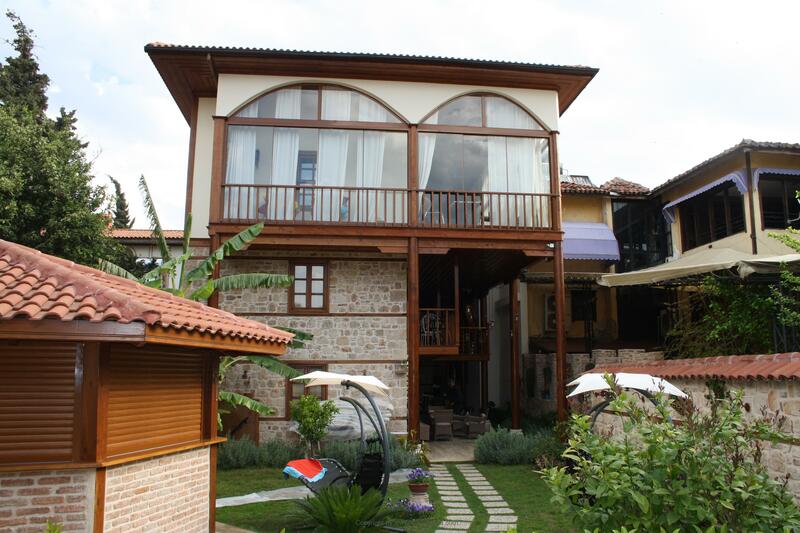 There are several small hotels inside the Kaleici – all with their own charm. CharMe is one of the newest shots on the tribe and opened as late as August 2016. I totally like these special old Ottoman buildings, many of which have sadly been allowed to decay for decades. Fortunately, one has now begun to realize the historical value of the buildings, and they are now all protected and with stringent demands for reconstruction. I talked about the strict requirements with Nurcan. We are used to them from Denmark, but how is it in Turkey? At least as strictly I should say. There is a requirement to recycle as many of the old materials as possible. Doors and windows must be placed exactly as they originally did and the rooms must above all not move as much as an inch. This can give rise to some challenges in today’s construction and especially when the building is to be used for a completely different purpose, than the original. 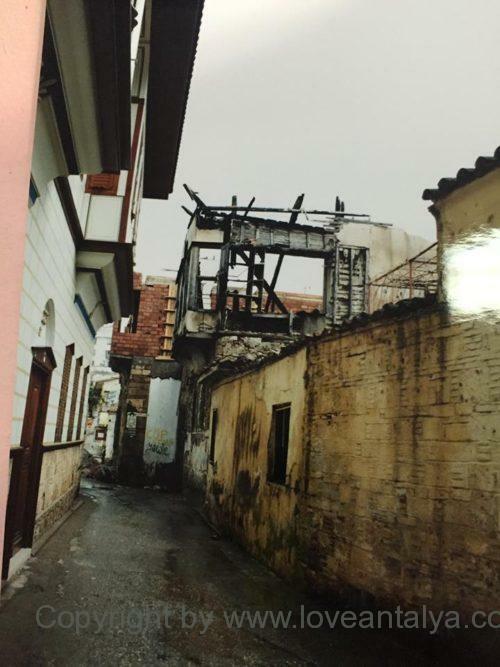 A big fire had raged the beautiful old Ottoman building, so everything was broken except the door and the big beautiful pills that hold the roof. Therefore, the couple hired an architect who could make sure everything went well and that they kept up to the current rules and frameworks. I was allowed to see the floor plans of the original building. Nurcan was also so nice to find a couple of old pictures from the building, as it looked when they bought it. WHAT A job they’ve had – but wildly fascinating to see the contrast between how bad it was then and how beautiful it emerged now. The hotel is located in the old town and has a lot of atmosphere. Much of the city is being rebuilt and several streets are closed to make room for tourists, cafes and outdoor dining. That’s something that really suits for Kaleici. To be used again as the central, busy, original part of Antalya, as it once was. But situated in the old town also means, that there is some noise from the streets. However, it is not quite as bad at this hotel as with some others. On the other hand, there is a mosque just next door – but it’s not unusual especially in the densely populated Old Town. The hotel is located just on the outskirts of Kaleici and it is very good, because the noise is not that loud and you have easy access to the big “Palm-street” that runs close by. This allows you to quickly get around, is close to the beautiful Karalioglu park and not so far to many of the sights in the city. It’s about. 300 meters to Hadrian’s gate, 500 meters to the marina and the old broken minaret just around the corner. Each room has its own bathroom and toilet and small cozy toilet items, air conditioning is a naturalness and also fridge and television. In the beautiful garden there is also a small pool with sun loungers around and a small bar, where you can be served from. The lobby is staffed all day and they are more than helpful to pick up from the airport, help you find the way, book a table at a restaurant, etc. etc. So there is nothing missing here at the hotel. Now it’s not because we have a villa of this type available at our family’s. But in some way, staying at this hotel was like staying with family. 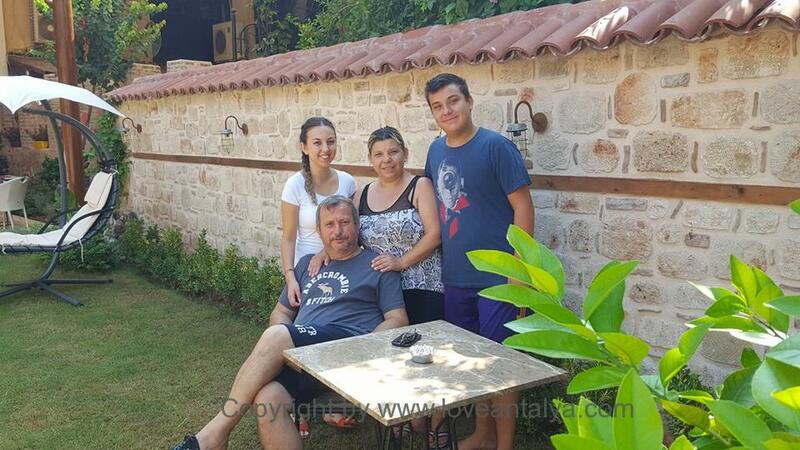 The hotel is run by Nurcan and her husband. Both are incredibly good people. Like almost all other Turks, they stand on sticks to help and make your stay as good as possible. Nurcan also speaks incredibly good English, because she has lived in Switzerland for a number of years. Here she worked for one of the major international travel companies like she also worked for the local Turkish Pamfylia Travel Agency, when it existed. That means, of course, that she knows what tourists are asking for and how things should be. Being at a relatively “small” hotel also means a lot to me. I like the little private, exclusive, yet relevant atmosphere that is here on the spot. Perhaps because the place is privately owned and you can feel, that the host couple is proud and actually cares for their hotel and customers. It just does something special than the fairly bigger and more commercial hotels. Quite informally I was invited to eat with them one day. Unfortunately I had already booked a table at a restaurant and I wouldn’t miss that either (it was the Vanilla restaurant wich you can read more about here). But I was given a fork in my hand, because I had to taste their dinner anyway. It just shows some of the hospitality in my eyes. One is not just a number in a row (and need I say, that the food tasted excellent too…). Next day I also got the wildest breakfast table, I have ever been presented with. Even for turkish standrads it was far beyond the usual. Many of the little delicacies were homemade, and I tasted things, that I have never tasted before. Ex. Homemade quince and orange peel, that was really beautiful. So alone for that reason, I would love to come again. Nurcan sat down and talked to me, when I almost finished my meal. And it turned out, that we were almost in family – at least according to Turkish standards. She was raised in the same small apartment complex, as my husband’s cousin, and could briefly remember my husband as a child. So, the world is really just a small one …! CharMe is the hotel to stayat, if you come outside the warmest season (Kaleici is not nice when there is +40 degrees and no air). At least, I have to go back with some girlfriends, because it was such a pleasent stay and it gets a clear recommendation from here. You can book a room and see more directly from their website here. If you wonder then YES, this post is sponsored by Char Me Boutique Hotel. But on my own initiative, I contacted them and asked if they would like to join. Fortunately, they did – and what an experience. I sincerely hope, that others would like to visit and experience this hotel. Because it has really been an eye opener for me, what you can do with a clear vision, pure will and innovative thoughts and how beautiful and cozy these small “old” hotels are in Kaleici.